Displaying the price only when it makes a significant move is the essence of point-and-figure charting. If nothing noteworthy happened on a particular day, you put nothing on the chart. Consider the point-and-figure chart to be event driven because chart events like a breakout or reversal often follow real-world events (breaking news, for example). For a new high that’s higher than the previous high, you enter a dot or an X. A column of Xs is an up move. For a new low that’s lower than the previous low, you enter a dot or an O. A column of Os is a down move. Each X column is reserved for rising prices and each O column is reserved for falling prices. You can’t put an X into an O column or an O into an X column. You start a new chart and enter an X next to the $9 label on the vertical axis. The next day, the price high is $10, so you enter an X in the same column at the $10 level. When the high reaches $12 the next day, you add two Xs to denote the move from yesterday’s $10 to today’s $12. You keep adding Xs in the same column until the price climb ends. In this example, the price stops climbing at $13. 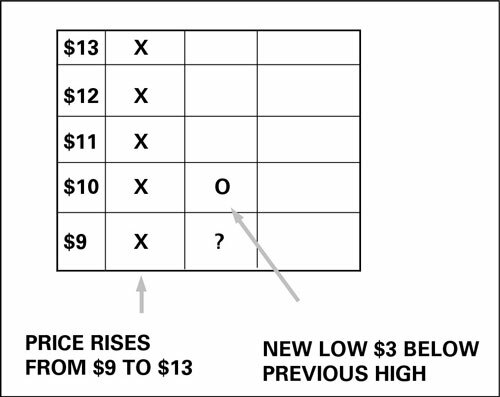 You see a column of Xs that represents the price rise from $9 to $13 in a single move. When the up move is over and the price makes a new low below yesterday’s low by a specific amount, you must start a new column, using an O and placing it at the dollar level of the new low. The preceding figure tells you that the new low came at $10. You now expect the next entry to be another O where the question mark is placed on the chart. Whatever happens next, the formation of a new column alerts you to a change in the price dynamics. Defining box size: The horizontal axis suppresses dates and compresses time, but the vertical axis is spaced in the conventional way. The choice of spacing on the vertical axis is still called the box size, even if you’re using a computer program and not actual graph paper. Choosing a box size: When you select a small box size, you’re asking to see a lot of detail, including small retracements. By increasing the box size, you’re filtering out filler data, just like when you make a rule that requires a price to cross a moving average by x percent. Computer charting programs adjust the box size to fit the screen if you leave the program in default mode. If you use P&F charting software, fix the box size so you know whether the range is expanding — the columns of Xs and Os get taller — or contracting — or whether the columns get shorter and there are more of them. To determine how far a price has to move below the X (upward) column to warrant starting an O (downward) column, you establish a second criterion, the reversal amount. The traditional reversal amount is three boxes. If your box is $1 and you’re now in a rising X column, you have to get a new low that is $3 lower than the low today to start a new O (downward) column. You can backtest a variety of box sizes and reversal amounts to arrive at the best numbers to use for any particular security. As a general rule, though, point-and-figure chartists recommend sticking to the three-box rule for reversals and adopting different box sizes for chart entries, depending on the absolute level of the prices. The price is higher than the previous high by $1: Enter another X above the last X in the column. The low is lower than today’s low by $1 or $2: Enter nothing. The low is lower than today’s low by $3: That’s three boxes worth, the reversal amount, and you start a new column, entering the O at a level $3 below the last X. The next day, if the low price is lower than yesterday by $1: Enter another O. If it’s higher, it has to be higher than today’s high by $3 to abandon the falling-price O column. What if you get a new high by one box and on the same day, also get a new low by the reversal amount — three boxes? The new low trumps the new high, and you should start a new column of Os. After all, you’re looking for a threat to the trend (and your pocketbook). A new low by the reversal amount constitutes a serious threat.